Are you sure you're related? He is my half brother yes! Super Market air is low quality eh! Heard it all now. So we now have to jack up our baby cars, remove all the air from the tyre. Then unless we have previously purchased a compressor, use a foot pump to replace the air. Things have got a bit out of hand here, any one doing that needs urgent help from the Medics. That is without trying to keep the car running and serviced. You're all over-thinking the seasonal differences in air quality - the real issue is using daytime air at night which as eny fule kno is a surefire recipe for problems. Us pro drivers reinflate our tyres at sunset and sunrise to avoid such issues. You're absolutely right. At this time of year, I find I'm going to work in the daylight but it's dark by the time I'm going home so I have to change my air out in the car park at my work before I can leave. It's not easy keeping on top of this stuff. 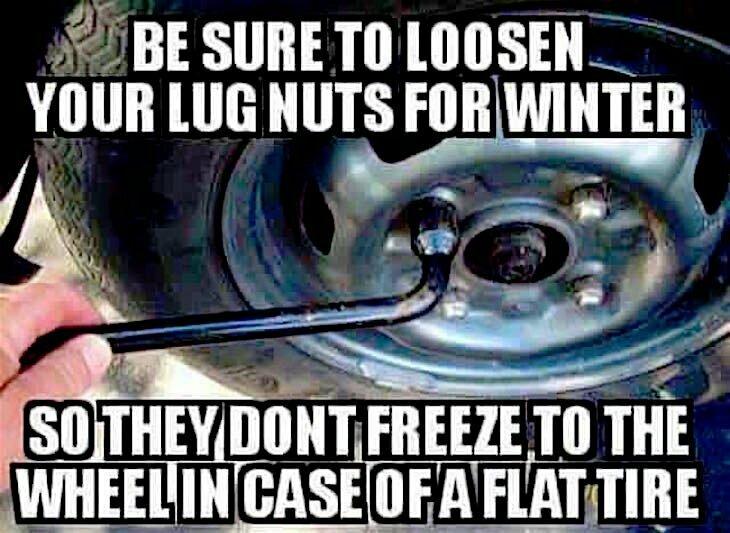 It would be much easier to keep pressure sensitive wheels and tyres in our boots. And take them indoors at night to keep nice and warm. At that l post no more.